Free hot breakfast spacious suites and I-465 two miles away thrill our guests at the non-smoking SpringHill Suites Indianapolis Carmel. The four-floor SpringHill Suites has 126 spacious studio suites each with a separate living area with sofa bed coffeemaker microwave mini-fridge iPod dock and flat-panel HDTV with premium cable. Don't oversleep and miss the free breakfast with a rotating menu of scrambled eggs omelettes bacon sausage Belgian waffles cereal pastries fruit yogurt coffee juice and more. At some point during your stay you should splash around in the indoor pool and soak in the hot tub. The hotel also has a fitness room laundry facility business center 24-hour market and free parking. The SpringHill Suites is on Highway 31 two miles north of I-465 three miles southwest of the Carmel Arts & Design District and 30 minutes north of Indianapolis. Merchants Square Shopping Center is two-and-a-half miles east and the Palladium is two-and-a-half miles northeast. If you're driving from Indianapolis International Airport the hotel is 29 miles northeast. This SpringHill Suites serves up a pleasant stay for our guests with its "excellent free breakfast" "comfortable rooms" and handy location "close to shopping." This all-suite countryside resort is located on 500 acres in Carmel California and is 9 miles from Carmel Beach City Park. A golf course is available at the resort.Every suite at the Carmel Valley Ranch includes a fireplace and free Wi-Fi. All suites feature an iPod docking station 42-inch flat-screen TV and refrigerator. The suites also provide a private deck and bathrooms with separate showers and soaking tubs.The Carmel Valley Resort offers a full-service spa as well as 9 tennis courts golf lessons and 2 outdoor pools. A gym hot tubs and scenic hiking trails are available as well. Free breakfast internet and a location that's within strolling distance of downtown sights make the Best Western Carmel's Town House Lodge the savvy traveler's choice. All 28 non-smoking rooms at this low-rise property offer free high-speed wired internet refrigerators coffeemakers expanded cable channels and free local calls. The hotel serves a complimentary continental breakfast each day and offers a heated outdoor pool sun deck and lounge. Parking is free. Located downtown two blocks from Carmel Plaza Shopping Center the Best Western is walking distance of shops and restaurants and a half-mile from the ocean. It's a mile-and-a-half from the Carmel River Lagoon and Wetlands Natural Reserve and a ten-minute ride to the scenic 17-Mile Drive or to the Pebble Beach Golf Course. Monterey Bay Aquarium and Pacific Grove Museum of Natural History are 20 minutes away and the National Steinbeck Center in Salinas is 40 minutes east. Point Lobos State Reserve is ten minutes south. Monterey Regional Airport is eight miles away and San Jose International Airport is 80 miles north. our guests rave about the primo location the pleasant sun deck and the "affordable modern rooms" at this Best Western in downtown Carmel. Homemade biscuits are available daily at this downtown Carmel inn. Rooms feature a flat-screen satellite TV and free Wi-Fi.The spacious rooms featuring unique furnishings offer plush bathrobes for guest use at Wayside Inn. Free toiletries and a hairdryer are provided in all rooms. Most rooms feature a fireplace.An expanded continental breakfast is delivered to rooms daily. Quiche cereal pastries and yogurt are included. An assortment of teas coffee and juices are also offered.Pebble Beach Golf Course is 10 minutes' drive from the Inn Wayside. The Monterey Bay Aquarium is 15 minutes' drive away. Free Wi-Fi massage services and comfy accommodations put our guests in a California state of mind at the relaxing Carmel Lodge. All 38 non-smoking rooms in this low-rise hotel feature free Wi-Fi sound machines with iPod docks and expanded cable channels; select rooms include fireplaces. Select accommodations also include coffeemakers. In-room massage services are available. Two blocks from Carmel Plaza Shopping Center downtown the Carmel Lodge is walking distance from shops and restaurants and a half-mile from the ocean. It's a mile-and-a-half from the Carmel River Lagoon and Wetlands Natural Reserve and 10 minutes from the scenic 17-Mile Drive and the links at Pebble Beach Golf Course. Drive 20 minutes north to visit the Monterey Bay Aquarium or Pacific Grove Museum of Natural History and 40 minutes east to check out the National Steinbeck Center in Salinas. Point Lobos State Reserve is 10 minutes south. Monterey Regional Airport is eight miles away and San Jose International Airport is 80 miles north. our guests tout the "location and value" of Carmel Lodge a hotel within "easy walking distance" of the sights and beach. 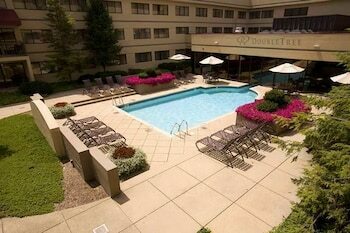 An indoor/outdoor pool spacious suites with plush beds and I-465 a mile away make our guests content with the Homewood Suites by Hilton Indianapolis Carmel. The three-floor hotel has 137 spacious two- and three-room suites each a plush-top mattress and high-thread-count sheets. You also get a separate living area a sofa bed two LCD flat-panel TVs with premium cable channels an mp3 clock/radio a mini-fridge a coffeemaker and a microwave. Wi-Fi is available for an extra charge. Come rain or come shine you can come to the indoor/outdoor pool and indoor hot tub for a refreshing swim and soak. The hotel also has a landscaped courtyard fitness room laundry facility business center bistro restaurant lounge and free parking. The hotel is on Highway 31 one mile north of I-465 and about three miles southwest of the Carmel Arts and Design District. Merchant Square Shopping Center is two-and-a-half miles east and the Palladium is two-and-a-half miles northeast. Downtown Indianapolis is 30 minutes south and Indianapolis Motor Speedway is 30 minutes southwest. The hotel is 29 miles from Indianapolis International Airport. This hotel triples the pleasure of our guests with its "excellent pool" "comfortable beds" and "convenient location" near highways and Carmel sites. Free Wi-Fi an indoor lap pool and I-465 two-and-a-half miles away earn high marks from our guests at the non-smoking Renaissance Indianapolis North Hotel A Marriott Lifestyle Hotel. The eight-floor Renaissance has 263 spacious and upscale rooms all featuring coffeemakers free Wi-Fi flat-panel LCD HDTVs with premium cable and connectivity panels for your iPod and other electronic gadgets. Rest and refresh on the plush Revive Bed with plush mattress topper 300-thread-count sheets and fluffy pillows. You're starting in lane one for a swim in the indoor lap pool. The hotel also has a fitness room laundry facility club lounge and communal table cocktail lounge with coffee and snacks steak and seafood restaurant with innovative American fare and free parking. The Renaissance is on Highway 31 two-and-a-half miles north of I-465 and three miles west of Carmel Arts & Design District and the Palladium. Shopping at Clay Terrace mall is three-and-a-half miles northeast. Downtown Indianapolis is a 30-minute drive and it's 20 minutes to the campus of Butler University. Indianapolis International Airport is 29 miles from the hotel. This "easy-to-find" Renaissance north of Indianapolis gives our guests super-cushy beds a "good breakfast" an indoor pool a "nice lobby" and technology-rich rooms. Free hot breakfast spacious suites free internet an indoor pool and Carmel Arts & Design District two miles away gratify our guests at the non-smoking Holiday Inn Express & Suites Carmel - North Indianapolis. The four-floor hotel has 75 spacious suites outfitted with coffeemakers microwaves mini-fridges free high-speed internet and premium cable TV. Most suites have sofa beds. Get a racing start to your day near Indy with the free hot breakfast including a rotating menu of eggs bacon sausage fresh waffles cereal pastries muffins fresh fruit yogurt coffee juice and more. Rain showers won't spoil your swim since the pool is indoors here. The hotel also has a hot tub fitness room picnic area and laundry facility. Note: Pool closed for renovation until August 6 2014. The property is off Highway 31 less than a mile north of Clay Terrace mall and about two miles north of Carmel Arts & Design District and the center of Carmel. Downtown Indianapolis is 35 minutes south and it's a 25-minute drive to Butler University. Indianapolis Motor Speedway is 35 minutes southwest and Indianapolis International Airport is 32 miles southwest of the hotel. The "large comfortable" rooms and "good" breakfast are just a few reasons why our guests give the "great" Rodeway Inn & Suites high marks. Free internet an indoor pool and proximity to the Carmel Arts & Design District are a hit with our guests at the Hilton Garden Inn Indianapolis/Carmel. The four-floor Hilton Garden Inn has 110 rooms all featuring the signature Garden Sleep System bed with 250-thread-count sheets and an adjustable mattress that conforms to your body. Rooms also feature coffeemakers microwaves mini-fridges mp3 alarm clocks free high-speed internet and LCD flat-panel TVs with premium cable. Some rooms have sofa beds. Soak your weary bones in the hot tub and take a soothing swim in the indoor pool. The hotel also has a fitness room laundry facility business center 24-hour pantry breakfast and dinner restaurant and free parking. The Hilton Garden Inn is off Highway 31 near shopping and several corporate offices. St. Vincent Carmel Hospital is a mile away. The Carmel Arts & Design District and the Palladium are two miles east and downtown Indianapolis is 35 minutes south. Butler University is a 20-minute drive south. Indianapolis International Airport is 30 miles from the hotel. According to our guests this Hilton Garden Inn has a "friendly staff" an "easy-to-locate" spot in Carmel and "wonderful" beds. Surrounded by attractions such as Cannery Row the Monterey Bay Aquarium and Fisherman's Wharf this hotel offers relaxing activities and sophisticated dining options in the centre of Carmel California.Free high-speed internet is featured in all rooms and throughout Carmel Mission Inn. Guests can go for a swim in the outdoor pool work out in the fitness centre or soak in one of the hot tubs. After exploring the hotel's private gardens visitors can relax with a massage.Fuse Lounge Cafe reflects Mission Inn Carmel's trendy design with vivid colours bamboo flooring and a stacked stone fireplace. Guests will enjoy specialty cocktails and modern entrees. Breakfast and dinner is available daily at the cafe. Free breakfast and a crackerjack location downtown help our guests live like locals at the Comfort Inn Carmel by the Sea. All 19 rooms at this low-rise hotel include refrigerators coffeemakers expanded cable channels and free local calls; non-smoking rooms are available. The hotel serves a free deluxe continental breakfast each morning for guests to enjoy before exploring in town. Located one block from downtown's Carmel Plaza Shopping Center the Comfort Inn is walking distance to shops and restaurants and a half-mile from the ocean. It's a mile and a half from the Carmel River Lagoon and Wetlands Natural Reserve and a ten-minute ride to the scenic 17-Mile Drive or to the links at Pebble Beach Golf Course. The Monterey Bay Aquarium and the Pacific Grove Museum of Natural History are each a 20-minute drive north and the National Steinbeck Center in Salinas is 40 minutes east. Point Lobos State Reserve is ten minutes south. Monterey Regional Airport is eight miles away and San Jose International Airport is 80 miles north. our guests cite "comfortable" rooms in a "very pretty setting" and a "convenient location" that's "walking distance to shops and Carmel Beach" as highlights of this Comfort Inn. Free hot breakfast free internet and an indoor pool lead to high ratings from our guests at the non-smoking Hampton Inn Indianapolis/Carmel. The five-floor Hampton Inn has 103 rooms all with signature beds regular desks and lap desks coffeemakers and LCD flat-panel TVs with premium cable. Some rooms have sofa beds jetted tubs or kitchenettes. This Hampton serves a free breakfast spread that has a rotating menu of eggs sausage fresh waffles French toast sticks cereal toast pastries fruit yogurt coffee juice and more. The hotel features an indoor pool a a fitness room business center free internet access a lobby fireplace with a sitting area and free parking. The Hampton Inn is on Highway 31 about two-and-a-half miles north of I-465 three miles southwest of the Carmel Arts & Design District and 30 minutes north of downtown Indianapolis. Merchants Square Shopping Center is three miles east and Indiana University Health North Hospital is one-and-a-half miles south. Indianapolis International Airport is 29 miles from the hotel. The "well-kept" Hampton Inn Indianapolis/Carmel fills the bill for our guests with its "very good" breakfast buffet indoor pool and location near the highway.